ONS 2018, Stavanger, Norway, 27th August 2018 – Odfjell Drilling has awarded Kongsberg Maritime the contract to deliver a real-time monitoring and advisory solution to provide operational safety and non-productive time (NPT) improvements for the 6th generation semi-submersible, Deepsea Stavanger. 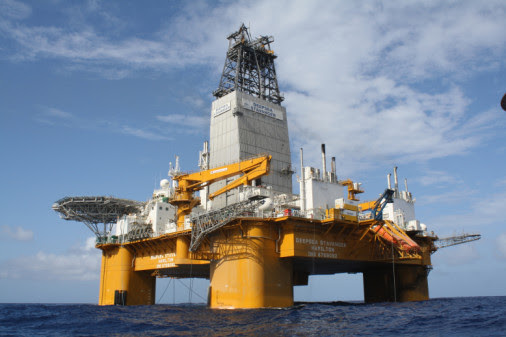 The contract is in specific relation to an upcoming offshore South Africa campaign awarded to Odfjell Drilling. Kongsberg Maritime's integrated services and systems delivery for Deepsea Stavanger is designed to provide high operational safety and availability in deepwater harsh environments, strong currents and high waves. The scope of supply includes the field-proven KONGSBERG Riser Management System (RMS) and the KONGSBERG Information Management System (KIMS), in addition to an extensive subsea technology delivery including Motion Reference Units, Sonar, underwater cameras and laser guidance. The KONGSBERG RMS features dynamic operability and dynamic watch circles, and high-end accurate BOP and riser instrumentation, with all functionalities integrated into the existing KONGSBERG technology on board, which includes Dynamic Positioning and automation systems. The integration will provide real-time monitoring and operational advice, contributing to reducing conservative operational limits due to uncertainties caused by lack of data. The system also provides functionality to support diverse operations, with safety and efficiency, including vortex induced vibration (VIV) detection. The KONGSBERG Information Management System is part of the delivery and allows replication of all RMS and related data to shore, opening the door for significantly improved operational support from diverse stakeholders including Kongsberg Maritime, the rig owner and oil company experts, as well as providing targeted dashboards and applications accessible on the rig and ashore. The result is a more efficient use of man-power and the ability to generate tangible improvements in non-productive time to support profitability. The KONGSBERG Information Management System also collects structured data typically used as basis for improved analysis of other wells.